Marcel Vigneron has dedicated his life to gastronomy and honing his skills as a chef. He’s an artisan who has an affinity for culinary knowledge, who uses a knife as an extension of his hand, the kitchen as a workshop , the earth as a grocery store. Marcel attended the acclaimed Culinary Institute of America (CIA) in New York and achieved his Associate’s degree in Culinary Arts, as well as a Bachelors Degree in Hospitality Management. At the CIA, Marcel enrolled in the teaching assistant program where he served as the Sous Chef at the school’s award-winning Ristorante Caterina de’ Medici. 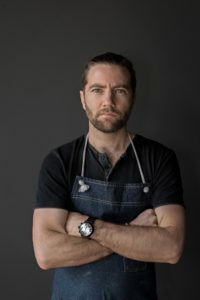 Since then, he has continued to pursue the progression of gastronomy and at the young age of 25 gained national notoriety in season two of Bravo’s hit reality series, Top Chef where he made it to the finals finishing “Runner-Up”. He has worked all over the globe with world-renowned chefs, including Joël Robuchon (named “Chef of the Century” by the Gault Millau) and Michael Mina (awarded “Best Chef of 2002” by the James Beard Foundation during the time of Marcel’s employment). Marcel has also spent time in Barcelona, Spain, where he took classes at El Taller with famed Chef Ferran Adrià of El Bulli restaurant, which was named the top restaurant in the world in 2007 by Restaurant magazine. Marcel worked under José Andrés as the Executive Sous Chef of The Bazaar at the SLS Hotel in Beverly Hills, which received the first 4 star review by the LA Times in five years. Marcel participated in Top Chef All-Stars at the end of 2010 and premiered the first season of Marcel’s Quantum Kitchen on the SyFy Network in February 2011. Marcel competed on The Food Network’s The Next Iron Chef in November 2012 and on Iron Chef in 2013. Food Fighters, Americas Best Cooks, Cutthroat Kitchen “Superstar Sabotage”, Chopped “Celebrity Chef Charity Version”, and Top Chef Duels are a few of the more recent shows that all feature Marcel. He currently resides in Los Angeles and runs his very successful catering company modern global tasting inc as well as his two restaurants WOLF which serves Modern California Cuisine with style and flair and Beefsteak which serves Conscious Plant~Based Cuisine with flavor and speed.